Dance teaching artists are too often isolated in their teaching settings. Whether as the only “dance specialist” at a school site or bouncing between multiple school sites in a single day or week, dance teaching artists often feel an absence of professional support. Unsure how to access a sense of a larger community of colleagues and unable to feel comfortable as representative experts of their discipline within their teaching settings, too often dance artists feel burned-out, uninspired, or even driven to leave the profession entirely. Luna’s Summer Institute (SI) was created to support dance teaching artists in developing their craft. Learning in a collegial group of diverse educators, SI participants improve teaching practice, gain confidence as professionals and develop long-lasting systems of support. Each year 6 dancers and 6 education practitioners (classroom teachers, social workers, ECE professionals, PE or music specialists) come together for intensive study in the dance discipline including a 7-day week, follow-up individual coaching and collegial exchanges throughout the academic year, a midyear refresher class, and a year-end presentation of their practice. 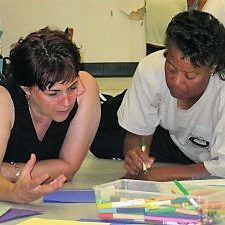 Course content includes everything described in DIDC-A, inclusion practices, culturally-relevant dance lessons, and extensive practice teaching. How can the Summer Institute support you in your career development? Read about the experiences of our SI alumni here. If you’re interested in Luna’s acclaimed Summer Institute, start the process by completing this form. Please send me a Summer Institute application when available. Application fee of $25. If the application fee is a hardship, please email Jochelle, jperena@lunadanceinstitute.org. Applicants are selected from a competitive pool. Participants must be teaching in the United States during their Summer Institute year.